The name that might immediately be recognized by many contemporary jazz fans from the lineup on this Japanese only 1984 release by drummer Akira Toyoda for the indie label Sound Design is Joe Lovano, which is quite odd being that it's not listed anywhere on Lovano's discography. In fact, there seems to be virtually no information available at all regarding this lp, except for a mention on bassist Dean Johnson's discography page, marking his very first session as a sideman and, from what I can tell, pianist Peter Madsen's as well. That this was the start of two fine jazz players career, a document of Lovano's fantastic early work, and perhaps Toyoda's only album (as a leader, or even as sideman?) makes it even more unfortunate there is no information on this session. Nevertheless, the playing throughout is incredible, showing the energy and creativity of these young players. 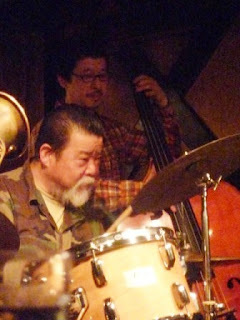 Toyoda and Madsen split composition duties, Toyoda contributing 'Benkei' and 'Tommy's Den' and Madsen the rest, with the addition of Coltrane's 'Some Other Blues'. The playing here serves to document the vibrant jazz scene in Japan that lasted up through the mid-80s that drew American players to visit the land of the rising sun, on other labels such as Why Not, Trio and Baystate. Moreover, this lp is a fine example of the many phenomenal albums recorded during this period that have yet to be unearthed. 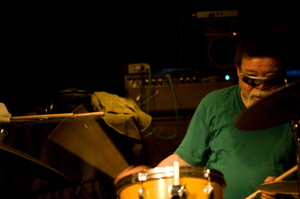 Although Toyoda seems to remain in relative obscurity, he's still active in the jazz scene today, so next time you're in Kyoto look up to see him at the Blue Note, or in Osaka at the Royal Horse. More heat!!! I can't wait to hear it. Is there gonna be a rip made available? Either way, THANKS! ask and you shall receive.. cheers, hope you enjoy! much thanks for all that sweet sweet music you keep bestowing on us. really appreciated. btw. are there any plans for upping the jocque and le scott ornette coleman songbook ? wow, that would be so great, can't thank you enough for that. and rise above to share and expose wonderful gems. a true pleasure. do you have anything by SPECTRUM PLEASE?